Ages 7 through 11. This book includes creative activities for using newspapers, magazines, and other printed materials to teach vocabulary and to develop expressive language skills. Students create word collages for pictures in the activity manual using words that they find in printed material. In Part 1, pictures are used to depict a situation that is open to interpretation. A thought-provoking question appears on each picture page. Students are asked to (1) list possible situations and words (or phrases) that describe the picture or related feelings, (2) find those words in newspapers, magazines, or other printed materials, (3) cut them out, and (4) create a word collage. 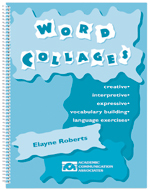 Reproducible pages include vocabulary and writing exercises. Students are asked to write a story about the picture using the words that were cut out and pasted onto their collage. In Part 2, groups of related words are presented in a variety of vocabulary activities. Students are then asked to list situations that these words describe, find pictures in newspapers, magazines, or other printed materials that convey the meaning of the words, and finally to create a collage with the selected pictures. The worksheet pages are all reproducible.